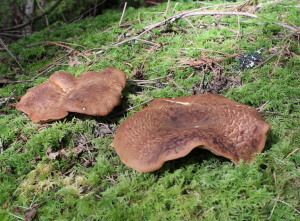 The earliest of the dye mushrooms, its colour varies from grey to green to a rich brown. My first mushroom dyepot of the season, using Tapinella atrotomentosa (Velvet Pax) yielded the colours on the left. 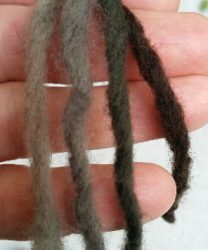 I’d seen some nice purple from this mushroom on unmordanted wool, and that’s what I was hoping to get on the large (unmordanted) sample at the left; it turned out to be more brown than purple. The lighter sample to its right was the exhaust bath, while the lovely purple was a small piece mordanted with alum. 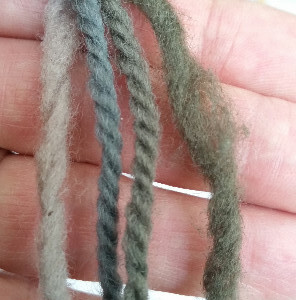 Proceeding to another batch of fresh mushrooms (and a thoroughly rinsed mesh bag), I put a large piece of alum-mordanted wool into the dyepot, and instead of purple, I got this great olive green! 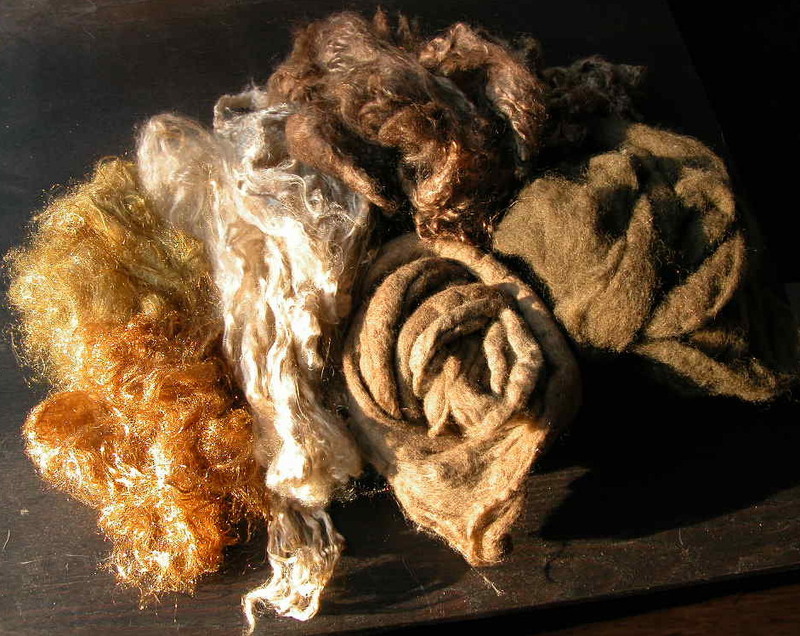 The alum-treated silk scrunchy also went through that dyebath, while the sample on the far right was mordanted with copper. 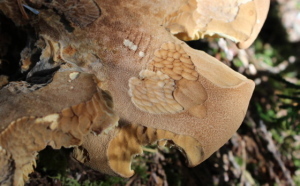 I wonder if the phases of the moon, or the way I crinkle my eyebrows, has anything to do with the unpredictable results from this mushroom. 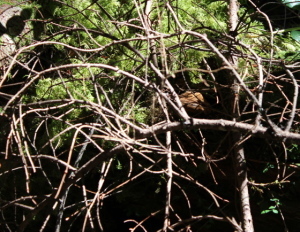 I believe all forest creatures, including myself, must learn to live together, but dammit! 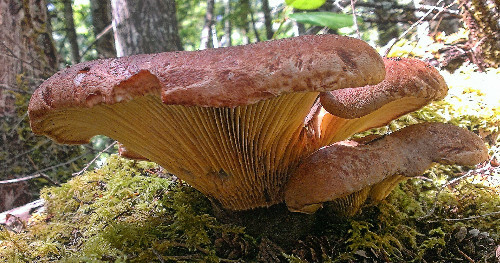 I’m not prepared to let the squirrels have my dye mushrooms when they already have plenty of forest food to munch on and store away at this time of year. These little buttons were just starting out when I found them on top of a mossy stump early in August, so I set up a twiggy-branch protection system for them (see my August 13 post) and hoped for the best. Sixteen days later, here’s what I found (after removing the twigs): beautiful, untouched specimens, fresh and perfect for the dyepot. And into the pot they went, that very same day. I’ll post pictures of the results soon. 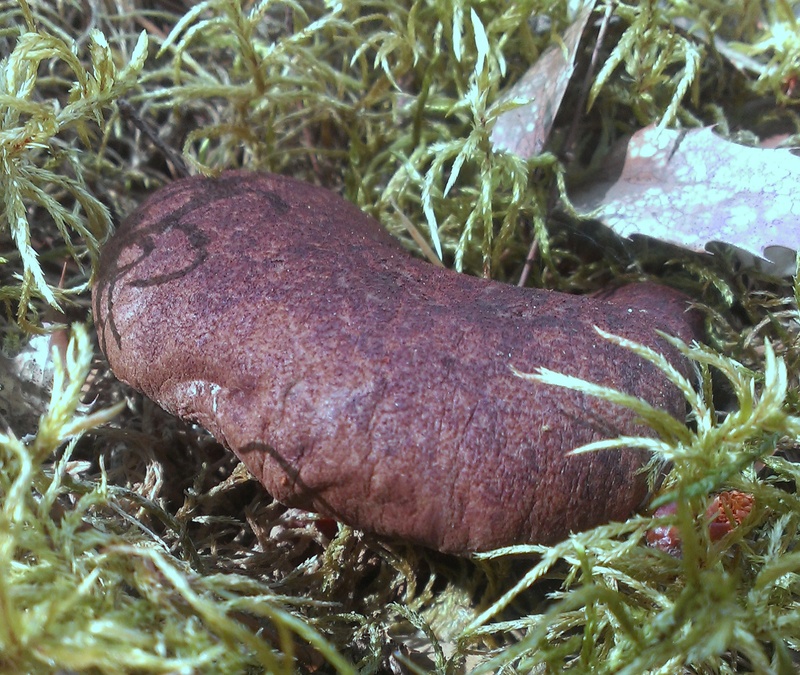 Our latest foray into the back and beyond proved exciting—the Tapinella atrotomentosa (which I still want to call Paxillus atrotomentosus, or Velvet Pax) are beginning to appear in the usual spots, on mossy old stumps and decaying logs. 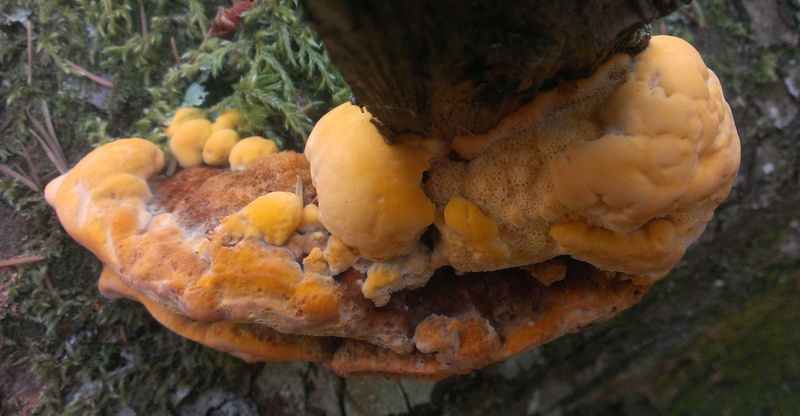 I even found a few in the roots of an old cedar—I usually see them on Douglas fir. I’m not the only one attracted to these beauties, however. These little gnaw marks are clear evidence that I’m in competition with squirrels. 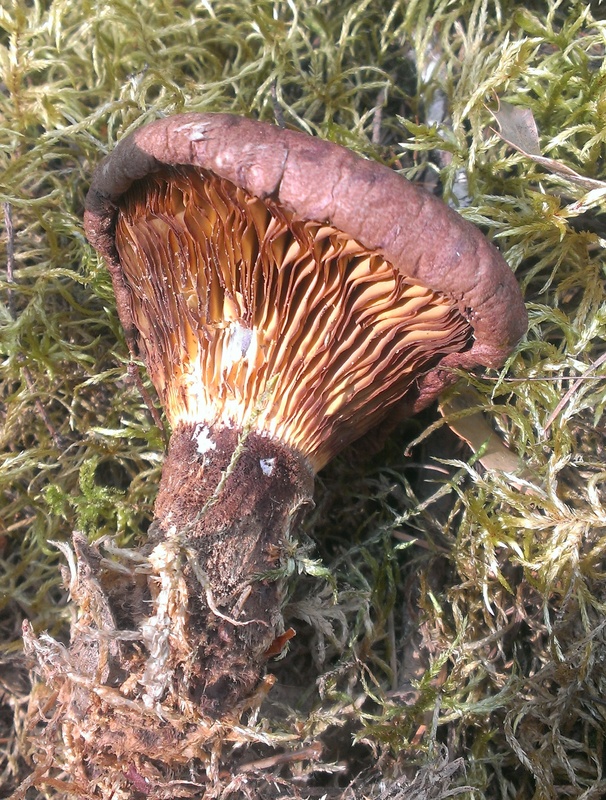 Because I’m selfish with my dye mushrooms, I decided to try a trick I’ve employed in my vegetable garden, to keep cats out of my freshly dug garden beds: I gathered up a bunch of twiggy branches and made a protective little cage over this button in the hope it can grow intact to a usable size. In the meantime, my first dyepot of the season, using the bits of Velvet Pax the squirrels decided to leave for me, is now under way, along with marathon mordanting sessions. 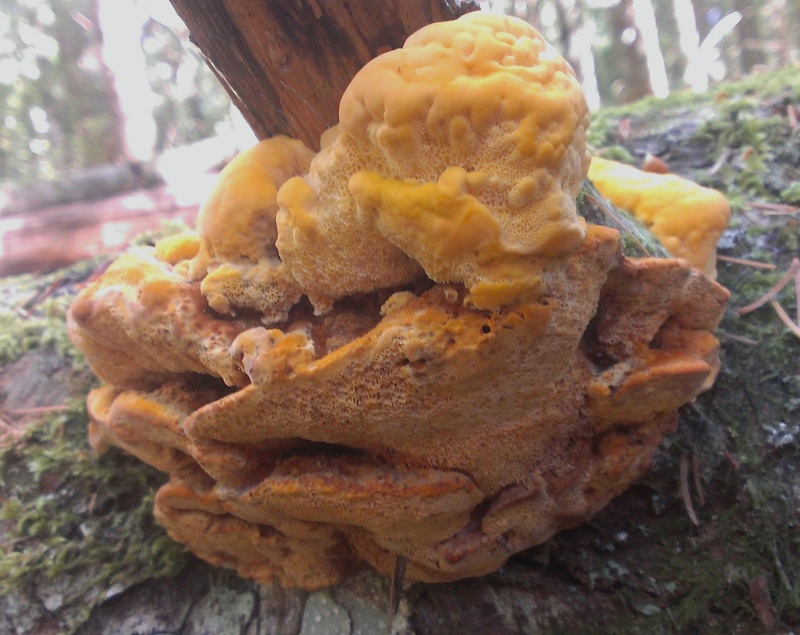 Bring on the dye mushrooms! 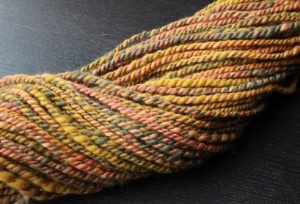 Moving on from the seemingly non-stop gold dyepots, I’ve now finished dyeing with all the Velvet Pax (Tapinella atrotomentosa) that I’ve been saving and drying since the summer. 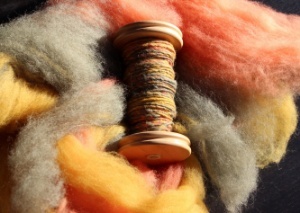 For this dyepot, I used equal weights of dried mushroom and fibre—330 grams of each—and dyed half the fibre at a time. 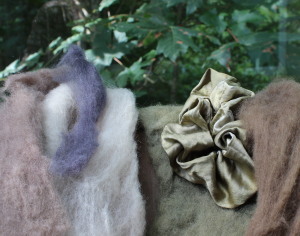 The dark green roving on the right was mordanted in iron. 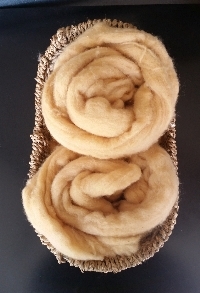 (Note to self: next year, premordant more wool with iron, to get more dark green!). It’s interesting how the “Icicle” on the left picked up golden tones, while the Tencel (the shiny brown at the top and the shiny beige to its left) picked up the browns. I probably could have done one more exhaust from this pot, but to be frank, I’m tired of the browns, especially when I all my lovely dermocybes are waiting for me to do something with them.